BERLIN, Germany -- German Chancellor Angela Merkel told Russian President Vladimir Putin on the phone that Sunday's planned elections in eastern Ukraine were illegitimate and would not be recognized by European leaders, a Berlin government spokesman said on Friday. 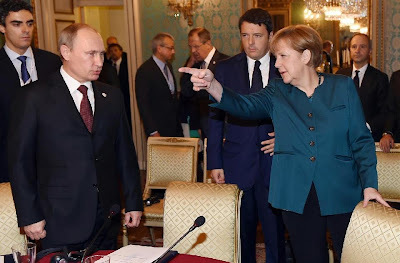 German Chancellor Angela Merkel (R), Russian President Vladimir Putin (L), and Italian Prime Minister Matteo Renzi arrive for a meeting on the sidelines of the ASEM summit of European and Asian leaders in Milan, northern Italy, Friday, Oct. 17, 2014. He said in the call there were diverging opinions on Sunday's "so-called elections" in the self-proclaimed people's republics of Donetsk and Luhansk. "Merkel and Hollande underlined that there can only be a ballot in line with Ukrainian law," he said, adding that the vote would violate an agreement endorsed by Russia and further complicate efforts to end the crisis in eastern Ukraine. "The German government will not recognize these illegitimate elections," Merkel's spokesman said. European leaders were united on this issue and had agreed on this at a summit last week in Brussels. Over 3,700 people have been killed in fighting in eastern Ukraine, where pro-Moscow rebels seek union with Russia. A ceasefire has been in force since September but there have been isolated flareups of fighting. A 12-point protocol, issued after talks in early September in the Belarussian capital of Minsk involving Russia, Ukraine, the Organization for Security and Cooperation in Europe and separatist leaders, foresees the holding of "early local elections" in the east in accordance with Ukrainian legislation. The Ukrainian leadership sees this as part of efforts to de-centralize power in the east to give people there greater say in running their own affairs - a strategy aimed at blunting calls for autonomy. It wants to hold these elections in December. "The Russian side speaks out in favor of establishing a sustainable dialogue between the central Ukrainian authorities and the representatives of the Donetsk and Luhansk regions which, beyond any doubt, would contribute to an overall stabilization of the situation," it said in a statement. "Russia must discourage the terrorists from carrying out these elections … it will be yet another step towards a ‘frozen conflict’ which is what we have to prevent there," he said. He said Kiev was committed to elections of local officials in the east with which a plan for de-centralization could be worked out. "But they should be clear local elections according to Ukrainian legislation," Klimkin said. It looks obvious that Russia intend to recognize unauthorized by Ukraine election scheduled on November 2nd in so called DNR and LNR. Ir Russia in fact does recognize those elections such act will violate Minsk Agreement, and Ukraine will have right to brake that Agreement as well by reactivating ATO and reinstating country's integrity.